WOW! If you routinely subscribe to a bunch of magazines or give subscriptions as gifts, this is definitely one of the best magazine subscriptions of the year. 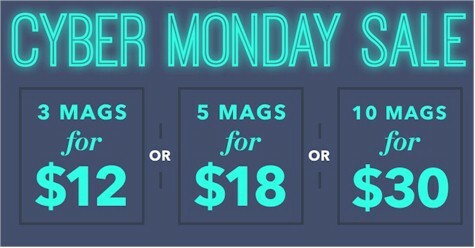 Pick 3 subscriptions for $12, 5 subscriptions for $18, or 10 subscriptions for $30 from DiscountMags. Subscription choices include magazine titles like Reader's Digest, Taste of Home, Wired , Bon Appetit, Woman's Day, Architectural Digest, Oprah, Vogue, Good Housekeeping, Weight Watchers, Town & Country, Popular Science, and lots more. Get magazines for the entire family, and you will end up paying only $3.00 per subscription per year!